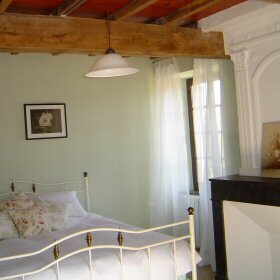 Luxury holiday farmhouse in the Midi-Pyrenees, France: sleeps up to 15 people in seven bedrooms. Esbayles has seven bedrooms; five of which are on the first floor and two on the ground floor. Further to that are four bath/shower rooms, two of which are ensuite. The rooms are full of the things that are important to our family when we holiday: large beds – king or superking, new orthopedic mattresses, 100% cotton linen, 100% cotton towels and wardrobes with plenty of hangers. Guests that stay for more than 1 week will have fresh bed linen and a light clean each week. Don’t forget to consider the sleeping arrangements for the younger members of the group; we have seven single beds and 2 travel cots.